Robert Saul, Karen Stever, Richard Saul and Ozzie Johnson bring new and exciting plants to the market. ItSaul Plants is a diverse plug company with a mission to introduce new plants to the market and to make good, but rare, plants available to all growers. 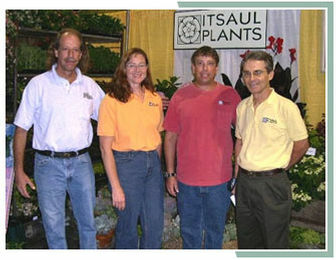 ItSaul Plants was founded in 1997 by Robert Saul, Richard Saul, Ozzie Johnson and Karen Stever. The four partners bring together art, science, business and an ever-present love of plants. Ozzie is a noted plantsman who has traveled the world collecting new varieties. Ozzie designs and installs high-end Japanese gardens for Atlanta homeowners and volunteers extensively at the Atlanta Botanical Gardens. Karen earned her Ph.D. in chemistry from Texas A&M University and conducted post-doctoral research at Scripps Research Institute in La Jolla, California. In 1995, after a brief stint in the biotechnology industry, she made a career change and joined the team at Saul Nurseries and then ItSaul Plants. Richard Saul's interest in plant breeding and his keen eye for unusual sports on plants have led to the introduction of many important new varieties including the Echinacea Big Sky Series and the Kniphofia Echo Series. Our facilities are located in the metropolitan Atlanta area. Arrangements can be made to ship worldwide. Please call to receive our current availability and price list.